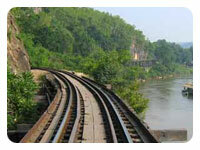 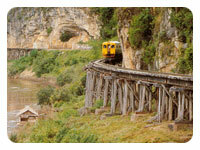 - Pick up from hotel depart Bangkok for Kanchanaburi province. 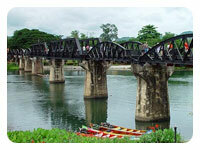 - JEATH War Museum This enclave in the riverside precincts of Wat Chaichumphon has been constructed largely in the from of allied prisoners of war camp. 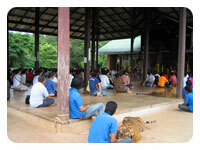 The name JEATH is derived from Japan, England, America, Australia, Thailand and Holland. 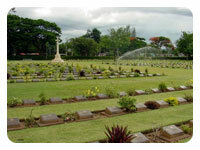 - Kanchanaburi War Cemetery, This cemetery contain the remains of 6,982 war prisoners who lost their lives during the Captivity of the Japanese Army that forced them to build the Bridge over the River Kawi and the Death Railway. 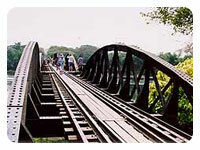 - The Bridge over the River Kwai, Internationally famous, the black iron bridge was brought from Java by the Japanese Army and reassembled under Japanese supervision by Allied prisoners of war labor as part of the “Death Railway” linking Thailand with Myanmar. 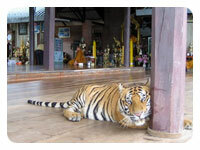 - Visit Tiger Temple (Wat Pa Luangta Bua Yanasampanno Forest Monastery, in Saiyok District of Kanchanaburi Province) in the dimension of Tiger Island Project and then touch the nature of tigers. 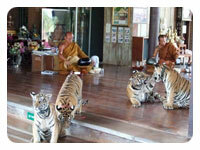 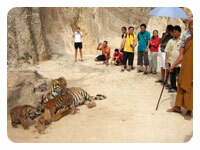 Tigers living in this Forest Monastery will be able to roam freely in their new home. 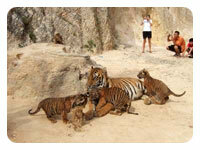 Furthermore, the new enclosure will be used for training the cubs, so that they learn to suvive in the jungle.